A series of 10 articles to be published in the journal “Astronomy & Astrophysics” describes various aspects of the deepest spectroscopic investigation ever carried out with the MUSE instrument installed on ESO’s Very Large Telescope (VLT) in Chile. 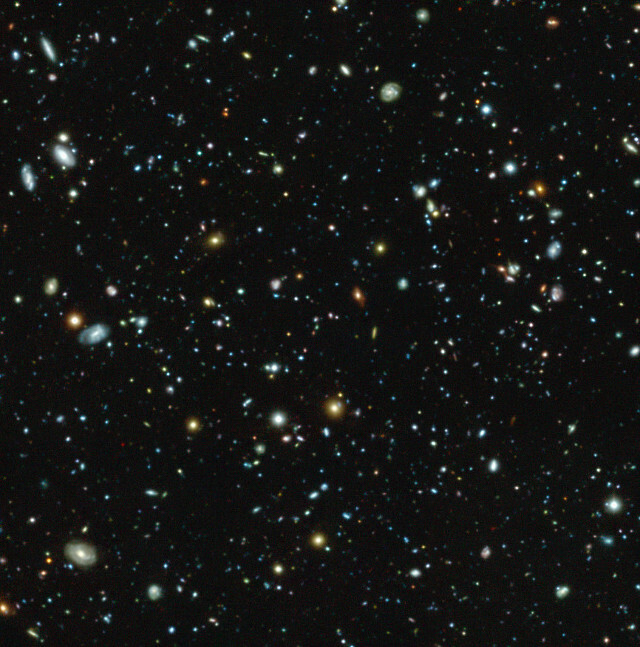 An international team with many researchers focused on the Hubble Space Telescope’s Ultra Deep Field (HUDF) to measure distances and properties of 1,600 very dim galaxies, of which 72 were never detected before. The Hubble Space Telescope Ultra Deep Field’s images were published in 2004. They investigated deep space more than it had ever been done before, revealing galaxies stretching back up to a billion years after the Big Bang. Subsequent observations of that kind improved the results obtaining in 2012 an extraordinary panorama of galaxies. These images have become a point of reference for astronomers who intend to study that area of ​​sky, an area of the constellation of Fornax (​​the Furnace). They’re useful for various studies carried out subsequently such as the one reported in various articles published in September 2016 which described various aspects of an observation campaign carried out using the ALMA radio telescope to show the relationship between the star formation rate in young galaxies and their mass. Various instruments, sensitive to different ranges of the electromagnetic spectrum and with different characteristics, are useful for different types of research. MUSE (Multi Unit Spectroscopic Explorer) can split up the light of every point in the image into its components to create a spectrum. It’s a possibility that the Hubble Space Telescope doesn’t have. This allowed the researchers to measure the distance, colors and other properties of the galaxies they could see, including some invisible to Hubble itself. The observations made with MUSE allow to see galaxies that are dim and very distant, up to 13 billion light years. In essence, we see them as they were when the universe was very young in astronomical terms. Galaxies are 100 times dimmer than those included in previous surveys are included and this further enriches our knowledge. The 72 new candidates are Lyman-alpha emitters, galaxies whose light shines only in the Lyman-alpha light of which the origin is still not clear. To detect them, an instrument with the characteristics of MUSE was needed because splitting up their light into its various colors makes them immediately apparent. The spectroscopic analysis of the observed galaxies allows to detect their chemical contents and the movements within them at once. At the same time, this study was able to detect hydrogen halos around the galaxies in the early universe, providing new information to study material flows in and out of them. In essence, this study was built on the information produced by the images of the Hubble Space Telescope’s Ultra Deep Field. This is one of the many examples of progress made with the use of new instruments to examine objects known thanks to previous ones.